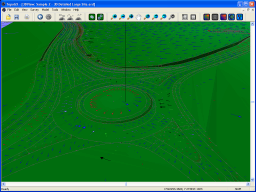 TopoGX is a high quality software application which can intelligently convert a 2D DXF drawing into a useful 3D DXF drawing. It is intended for surveyor produced drawings like the one to the right here (click the image for more details), but is equally suited to any 2D drawing where the Z levels are represented as text items. Additionally TopoGX contains a powerful triangulation engine which can produce a constrained delaunay triangulation (viewable surface) of a 3D drawing almost instantaneously. Automatic 2D to 3D DXF Conversion. Numeric text items are converted to Z levels. The X,Y point for each Z level is intelligently determined. The X,Y point may be assigned to a cross, block insert or line end. 2D arcs are converted to curved 3D polylines. Z levels are assigned to line and polyline features wherever appropriate. Automatic detection of block inserts which are suitable for level assignment. Automatic reasonable level range creation will filter out incorrect levels. Automatic level interpolation along polylines where levels may be missing. The 3D lines and polylines are used as constraints for the surface triangulation. Can handle huge datasets - 100,000's of points is no problem. Very fast - 5 seconds is a typical complete conversion time on an average modern PC. 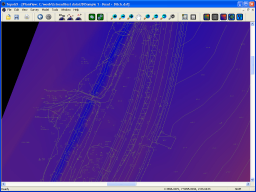 Easy navigation of DXF in PLAN with several tools to Zoom, Pan, Window and Centre your drawing. 3D Height Colouring shades your converted DXF Surface according to level. Colour shading enables quick and easy site appraisal. 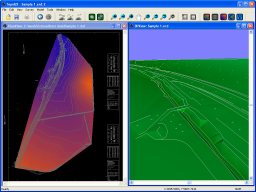 Shows your 3D surface instantly and allows quick viewing of any survey errors or inconsistancies. The Google EarthTM style navigation allows easy movement around your 3D model. 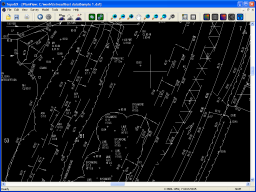 Contains a simple set of DXF Tools to insert/edit 2D/3D Points. 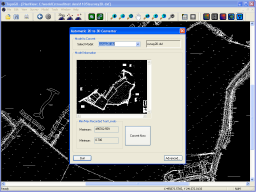 Breakline/Constraint tool allows insertion of contraints into your DXF where the original data may have been missing or incorrect. 3D Polyline mesh in a DXF file. MicroDrainageTM triangulated surface *.pwf file. Google EarthTM *.kml file (for UK OS-Grid coordinates). HTML 3D Orbit web page (see example).